Northern Tablelands MP Adam Marshall on the recently completed section of the Carnarvon Highway, which had a $3.5 million upgrade. ROAD upgrade works on a notorious stretch of one of the most important freight routes in the Moree Plains Shire, the Carnarvon Highway, are completed Northern Tablelands MP Adam Marshall announced today. Mr Marshall said the $3.5 million upgrade of a six-kilometre stretch of the highway between the Carole Creek Bridge, 11 kilometres north of Moree, and Marshall Pond Bridge, at the entrance to the village of Ashley was completed late last month. The work saw the road surface completely rebuilt and widened. Mr Marshall inspected the new section of road last week said the project was part of a multi-million-dollar program that was upgrading key freight routes across the area. 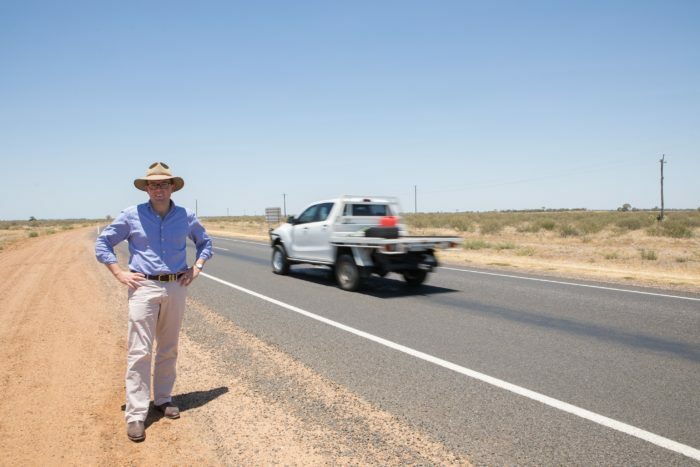 “This section of the Carnarvon Highway was very narrow with crumbling edges and with the large volume of heavy vehicle traffic, it had become quite dangerous for all road users,” Mr Marshall said. “It is a major transport artery between Moree and the towns of Mungindi, Garah and Ashley, with almost 2,000 vehicles using it each day, but this section had fallen into poor condition. Mr Marshall said the work was undertaken by Moree Plains Shire Council on behalf of Road and Maritime Services (RMS) and was completed on time and on budget. “The difference between the old and the new road surface couldn’t be starker and I commend Moree Plains Shire Council for cracking on with this project so quickly and doing a great job,” Mr Marshall said. Mr Marshall said the project followed the completion last year of a $2.7 million reconstruction and widening of a 6.7 kilometre section of the highway to the immediate south, between Gwydir River Bridge and Carole Creek Bridge. “In total, this 13-kilometre stretch of the highway was the narrowest and most dangerous and I am delighted that after the successful completion last year, we were able to secure more funds to upgrade the final section and provide a safe highway for local producers and motorists,” he said.